Leaders who move up, end up leading people who are smarter than they are. Be thankful, even if it’s stressful. Hinder the development of talent. Obscure the brilliance of bright talented teammates. Remarkable leaders share the spotlight. They don’t steal it. Aspire to be the dumbest smart person at the table. #1. Don’t put yourself down. #2. Work on leadership, management, and people skills. People skills matter more than technical, when you lead the team. #4. Learn and practice coaching. Olympic swimmer Michael Phelps has a swimming coach. I’d wager Michael’s coach doesn’t swim as well as Michael. Set high standards if you expect the best from smart people. #5. Keep everyone in the loop. Don’t use knowledge as status. Leaders who keep smart people in the dark hobble everyone. #6. Voice smart questions to smart teammates. What are some important issues? What are some potential next steps? What contingencies should we consider? What are some key inflection points as we move forward? #7. Imperative: Make decisions. Don’t abdicate decision-making responsibility to subject area experts. Stay humble when you’re right. What smart things might leaders do when they lead teams who are smarter than them? Bill Bellechick would be helpless on the field, on the sideline he’s a master coach, position like Bill, leverage your competency for the groups excellence.. IQ may not be your unique contribution. Thanks Ken. One of the great skills leaders can develop is coaching. It’s one important way to bring out the best in people. I absolutely love this post! The best leaders surround themselves with people that will help further the cause or reach the goal. It seems so obvious that we can’t be the best at everything (and many must be reminded of this often) but that doesn’t and shouldn’t limit our ability to make a difference. The coach for Michael Phelps is the perfect example of that. Thanks Vicki. “…further the cause and reach the goal.” That has a ring to it. Surprisingly, there are still places where the great leader is still desired. The great leader always knows what to do and how to do it. If we aren’t careful, we start to think that we are better than everyone else because we have a position. I like to suggest that leaders are at the bottom of the heap, lifting everyone else. I was once told that if you are the smartest person in the room you should find another room. Made perfect sense and has allowed me to learn from some pretty fantastic individuals over the years. Thanks Nancy. Wonderful. Find another room! Of course it takes humility to not be the smartest person at the table. Thanks T. What’s more intimidating than a room full of PhD’s? I appreciate your observation and candor. Maybe you should imagine them in their underwear? Best for the journey! When I faced that situation, I worked at acknowledging the person’s intelligence and sought his opinion frequently. I think it was one of the only times he had a boss respect his abilities. t way. Funny thing, one day he dropped by and found me using a thesaurus. He asked me what I was doing. When I told him I was looking for just the right word, he said he had never seen a boss use one before. It made an impression on him for me to use a tool like a thesaurus. Turned up to be another way to show I didn’t know everything. Thanks Lyndie. Very useful comment. Loved the illustration of being seen using a thesaurus. That’s the power of modeling the way. You can’t buy that. The other thing I really enjoyed was you emphasis on respect. Funny thing is respect doesn’t cost organizations or leaders one thin dime. Sadly, disrespect is too often connected to the way leaders treat others. BTW — thanks for all the twitter support! People Management – Akbar the Great, like the Sun in the Solar System with the nine planets, surrounded himself with nine gems, nine individuals who excelled in their fields, whom he called ‘Navratnas’. Each one of them, right from Raja Todarmal, some of whose policies on land tax are still followed, to musical maestro Tansen etc were all rare and unique. It is important to know that Akbar could not read or write, he was a wise man. Wisdom excels mere knowledge. Wisdom makes one humble and mature, but knowledge can be arrogant. Maharaja Ranjit Singh too attended no school, but have a look at how this descendant of a small ‘MISL’ rose to be called ‘Sher – e – Punjab’. There are priceless lessons in the lives of these two emperors from India who lived in different times, both lost their father at a very tender age and learnt and literally rose from the ashes. group of the key members and involve them in taking new creative ideas and guidance to build a competitive edge. It’s more of an active involvement, make them feel that they are important players and their contribution is valued to ensure the team’s success. At the Global Leadership Summit last week, Patrick Lencioni said the ideal team player has three traits – Humble, Hungry & Smart. This lines up perfectly with your message Dan. A Leader has to be humble enough to guide and get out of the way. Dan, I would love to see you at GLS next year. Your message would really resonate! I wholeheartedly agree with the premise of your article, but I submit that you should replace the term “smarter” with the phrase “more proficient” than you. 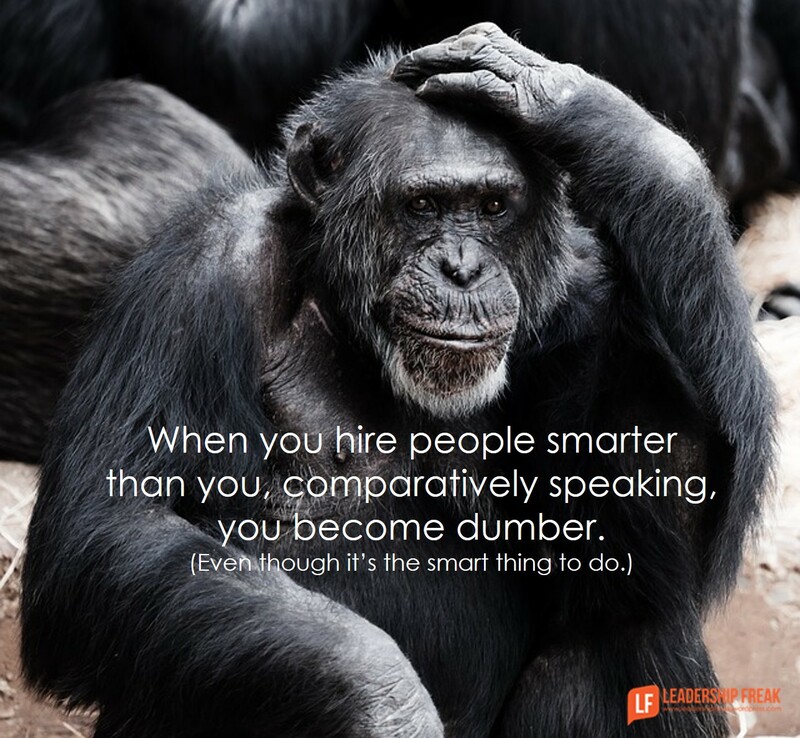 I use that particular terminology because the new employees are not necessarily smarter than you in terms of their intelligent quotient, but they likely possess certain attributes that may exceed your capabilities in a particular area of the business. I have been fortunate throughout the years to have hired, coached, and mentored several employees who moved on to director and VP-level positions after working on my team for a few years. I have always enjoyed the teaching/coaching aspect of management, and I came to realize that my position as a group manager was analogous to the classic drill sergeant who molds raw candidates into professional officers throughout their officer candidate school training. When the newly minted second lieutenants receive their promotion, the drill sergeant salutes each of them because they are now his superior officer, but they all know who made that promotion possible. Receiving a sincere thank-you from a former employee who successfully moved up the corporate ladder after you put the time into coaching and mentoring them is a gratifying reward unto itself. All I could think of was the Washington Post article I just read where Trump is quoted as saying he needs to be smarter than his people. I’m sure he thinks he knows better! Be grateful they’re smarter than you. 1. They bring things to the table you never thought about. 2. Shared leadership gets more done. 3. All of us are smarter than any of us. 5. You can’t know nearly half as much as all of them.